Reepham contains the villages of Reepham, Kerdiston and Whitwell, as well as the deserted village of Hackford (not to be confused with the village of the same name further south). 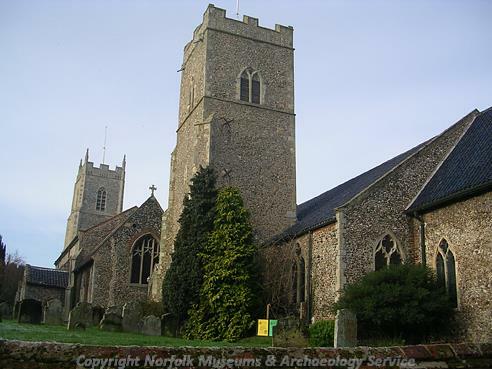 It is a large parish and has over 150 archaeological site records, and is situated in the Broadland district council area. The name ‘Reepham’ derives from the Old English for baliff’s manor. There have been a large number of objects from the prehistoric period recovered from this area. This included a number of flint flakes (NHER 25100, NHER 33321) as well as Neolithic worked flints such as axeheads (NHER 3133, NHER 7432, NHER 24788) and knives (NHER 30576). From the Bronze Age copper alloy axeheads, (NHER 33321, NHER 17889) have been recovered, as well as a flint knife (NHER 33504), but most excitingly perhaps are a hoard of Late Bronze Age objects (NHER 3134) recovered from the grounds of Hackford Hall in the 1740s. Although Iron Age objects are rare, two Iron Age brooch fragments have been recovered (NHER 33818, NHER 34456) and a hinged brooch (NHER 25298) of possible Iron Age or Roman date was found north of Carr’s Farm. Objects from the Roman period have been a much more prolific find. These include pottery sherds (NHER 33321) and coins (NHER 30977, NHER 33504, NHER 33818), as well as metal objects such as fittings and brooches (NHER 33322, NHER 33382, NHER 34456). A number of these objects have been recovered from sites near to the Fen Causeway Roman road (NHER 2796), which cuts the parish in the south, just above Whitwell. The road itself dates from the 1st or 2nd century AD, and was an important link from the junction of Ermine Street and King Street near Peterborough to the fens and the Roman town at Brampton. A number of cropmarks have been recorded just south of the road, and it is thought that these represent a Roman military camp (NHER 36117). It may be that the presence of this transport route is responsible for the presence of remains from the Saxon period, a time from which finds are usually rare. Here they include personal ornaments such as brooches and buckles (NHER 3150, NHER 33505, NHER 33382), as well as pottery sherds (NHER 7445, NHER 40002) and coins (NHER 33321, NHER 33322). Of particular interest are a surprising Late Saxon or early medieval sword blade (NHER 7435), as well as a fine square-headed brooch, coin pendant and gold bead (NHER 34456). Despite this surprising amount of objects, the Domesday Book has very little to say of Reepham, which is given a very low value. It appears that at this time Kerdiston was a far more dominant area, with a high number of animals of a number of types, as well as beehives, woodland and meadows. Interestingly, Kerdiston is also mentioned as having ‘1/2 church… also half of 1 priest’, presumably indicating that the church was shared with another parish. Whitwell is also mentioned, and also appears to have been far more prosperous than Reepham, with two mills, part of a fishery, a number of beehives and numerous animals of many types. Even the deserted Hackford is mentioned, again outshining Reepham with a mill, beehives and numerous animals. However, despite being only small in the Saxon period, by the medieval period Reepham had become the centre for Christian worship in the surrounding area. Indeed, the churches of Whitwell, Hackford and Reepham are all situated within a single churchyard in the modern centre of Reepham! Parish boundaries originally divided them, but in 1935 the the Hackford, Whitwell, and Reepham with Kerdiston parishes were abolished, and one single parish created under the name Reepham. Of these three, Hackford Church (NHER 7471) was ruined by fire in 1543, and today only the west wall of the porch survives. However, St Michael’s church of Whitwell (NHER 7470) survives intact, although now redundant and refitted as part of Reepham’s church, despite possessing the more prominent and pretty tower. The oldest part of this building dates to the 14th century, with the tower and porch dating to the 15th century. Still in use is the church of St Mary (NHER 7469), which has a font of about 1200 and a south arcade of about 1300. The remainder of the church is probably 14th century, and inside is a 14th century De Kerdiston tomb of international importance, as well as a 14th century brass. Although Hackford remained a separate parish until 1935, it is thought that the village itself became deserted during the medieval period. 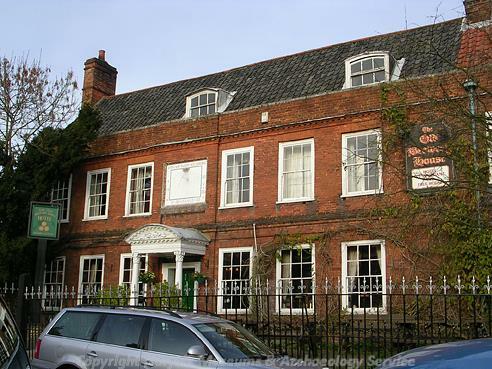 Hackford Hall (NHER 3151), a 17th to 19th century building, is said to occupy the area that once formed the village. Also deserted by the medieval period was Whitwell (NHER 3152), for which there is no certain location. However fieldwalking in an area to the north of the modern Kerdiston area noted a site with a particular density of medieval finds (NHER 36573), so it is possible that the Kerdiston settlement stood in that area. There are a small number of other sites dating to the medieval period. These include the site of the Chapel of St Nicholas, Whitwell (NHER 13296), which formerly belonged to Pentney Priory, as well as the base of a medieval stone cross (NHER 13390) marked on old maps as Kerdiston Cross. Medieval buildings are few, although Vale House (NHER 40525) is a probable medieval hall house, floored and extended in the 17th century. Of possible late medieval date is Moor Farm (NHER 18882), which was clad in brick in the early 19th century. Also of medieval date is Giant’s Moat (NHER 3137), a medieval moat situated just south of the Kerdiston area, which is still water-filled. Other possible medieval earthworks have been identified near Whitwell (NHER 3147). A number of medieval objects have also been recovered from the parish. These included the pottery sherds (NHER 29161, NHER 7435, NHER 15181), as well as coins (NHER 15029, NHER 31565, NHER 33505) and personal objects such as a signet ring (NHER 7434) and a gilded pendant (NHER 19237). Of particular interest is a very fine medieval gold finger ring (NHER 34049) recovered from an area at the very northwest of the parish, and a small number of lead spindle whorls (NHER 49853). Similar objects have also been recovered from the post medieval period. However, the post medieval period has also left a large number of buildings. Sites of interest include 17th century Old Brewery House (NHER 21558), 19th century Whitwell Hall (NHER 3153) and Whitwell Hall Farm (NHER 3155), as well as Eade’s Watermill (NHER 3160), an 18th century watermill with associated miller’s house and barns. Of particular interest is Cardinal's Hat, a late 16th century timber-framed house with a remarkable method of jettying based on a single post (NHER 12098). Indeed, there are so many buildings of interest in Reepham it is impossible to mention them all – English Heritage has listed some sixty-one! As a result of more recent historic events, there is also a World War Two pillbox (NHER 30612) situated on Jordan Lane, as well as a World War Two spigot mortar emplacement on the crossroads of Forewater and Kerdiston Roads (NHER 32449). Ruth Fillery-Travis (NLA), 2nd April 2007.